Chief Richard Combs executed 54 year old Bernard Bailey. Call it what you will but the facts are a man was executed over a moving violation and extreme ego by a problem police officer who never should have been in possession of a gun. American police can freely kill and murder anyone and not spend a single day in jail. Yet when one officer is killed people are immediately jailed, accused, characters assassinated and prosecuted to the full extend of the law. Police and government immediately accuse “anti-police brutality groups” of causing the problem when in fact its the acts of a few officers who go unpunished. Police chief Richard Combs was sentenced to one year of house arrest on Tuesday after pleading guilty to killing an unarmed man in a town hall parking lot. Although police chief Richard Combs has been tried twice this year for the murder, both proceedings ended in a mistrial. On Tuesday, the former police chief entered a guilty plea of misconduct in office. On May 2, 2011, Bernard Bailey, 54, arrived at Eutawville’s Town Hall to request an extension on a ticket issued to his daughter for a broken taillight in South Carolina. Six weeks earlier, Eutawville Police Chief Richard Combs had pulled over Bailey’s daughter who ended up calling her father to the scene to provide proof of insurance. After briefly arguing with Bailey, Chief Ricahrd Combs issued a traffic ticket to his daughter and claimed Bailey was interfering. Other police at the scene later testified that Bailey’s conduct did not equate to interference with an officer. However, Combs contacted a magistrate after the traffic stop and obtained a warrant against Bailey for obstruction of justice, which carries up to 10 years in prison. Combs did not inform Bailey of the charges against him. When Bailey appeared at the Town Hall weeks later, Combs began arguing with Bailey again and attempted to arrest him. Without threatening or attacking the police chief, Bailey exited the building towards his truck. As Combs followed him into the parking lot, Bailey entered his vehicle and turned the ignition. Before Bailey could close his door, Combs reached inside the truck, attempting to shut off the engine. According to Combs, he became entangled in the truck’s steering wheel while trying to turn off the ignition. As the truck backed out of the parking space, Combs fell to the ground and pulled out his gun, shooting Bailey twice in the chest and once in the shoulder. “He was probably upset because a black man decided to leave him, and he was a law enforcement officer,” said Bailey’s brother, the Rev. Kenneth Bailey. Combs was placed on paid administrative leave after the shooting and dismissed from the police force six months later. 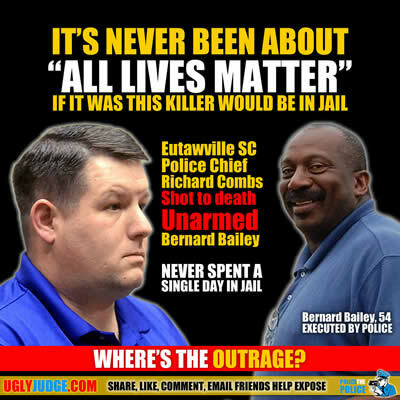 Prior to this dismissal, in 2007, the Orangeburg County Sheriff’s Office had fired him for unsatisfactory performance.